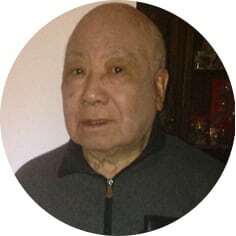 Chung Len “Leslie” Yee, a long time businessman in Moose Jaw, SK, passed away on Thursday, April 4th, 2019 at the age of 87 years. Leslie was born in China and came to Moose Jaw in 1949. In 1952 he started the Bamboo Café with his father, and operated it with his family until July 1st, 1998. He married Fung Ming “Minnie” Lo on January 8th, 1955 in Hong Kong, then returned to Moose Jaw where they raised 4 children. He was predeceased by his parents. Leslie will be lovingly remembered by his wife of 65 years, Fung Ming “Minnie”; daughters: Linda (Greg), Lily (Maurice), and Brenda (Terry); son, Wayne; grandchildren: Jade (Michael), Kyle (Melissa), Daniel, and Michael; great-grandchildren: Rowin, Rosalie, Cooper, and Mila; sisters, Jean and MaryAnn; as well as numerous other relatives. The Funeral Service will be held on Friday, April 12th, 2019 at 1:00 p.m. in Moose Jaw Funeral Home. Interment will take place in Rosedale Cemetery. As an expression of sympathy, donations in Leslie’s name may be made to the Canadian Cancer Society, 1910 McIntyre St, Regina, SK S4P 2R3. Arrangements are entrusted to Moose Jaw Funeral Home, 268 Mulberry Lane. Todd Sjoberg, Funeral Director 306-693-4550. My condolences to the friends and family of Les. One of the nicest persons I have had the opportunity to know. Dear Minnie and Wayne; I was sorry to hear about Les.Every time I came into the cafe,he would always come out to say hello while Minnie or Carole would take our order.He was such a funny and kind man,and when you closed I really missed the food!Les will now be making the best Chinese food in heaven!Wayne,take care of your Mom,she’s a very special lady!Again,my deepest condolences to you all,sincerely,Donna McSherry. My condolences to the family for your loss.